WILL HISTORY REPEAT ITSELF ON A GLOBAL SCALE……. 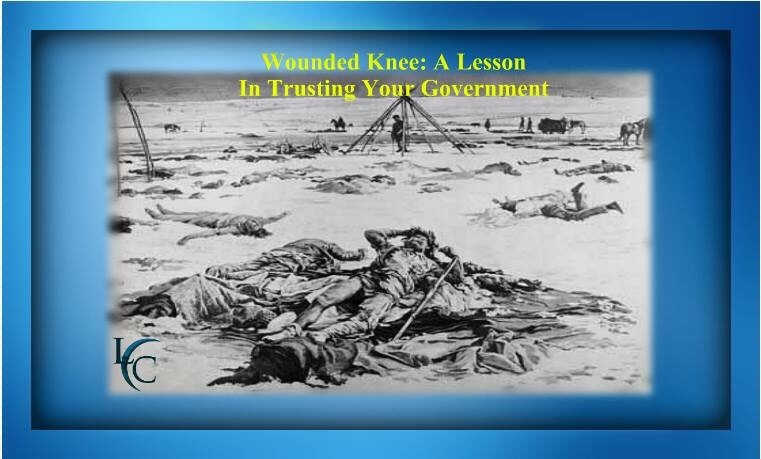 December 29, 2012 marked the 122nd Anniversary of the murder of 297 Sioux Indians at Wounded Knee Creek on the Pine Ridge Indian Reservation in South Dakota. These 297 people, in their winter camp, were murdered by federal agents and members of the 7th Cavalry who had come to confiscate their firearms “for their own safety and protection”. The slaughter began after the majority of the Sioux had peacefully turned in their firearms. The Calvary began shooting, and managed to wipe out the entire camp. 200 of the 297 victims were women and children. About 40 members of the 7th Cavalry were killed, but over half of them were victims of fratricide from the Hotchkiss guns of their overzealous comrades-in-arms. Posted on October 16, 2015, in Uncategorized and tagged Actress: Can’t Buy Me Love. A life coach, and personal empowerment expert, business consultant, Dr. Lisa Christiansen, health and wellness, Life Coach, Lisa Christiansen, Lisa Christine Christiansen, motivational speaker, self empowerment, success coach. Bookmark the permalink. Leave a comment.